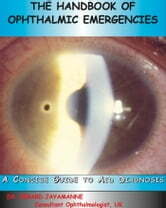 The Handbook of Ophthalmic Emergencies describes most of the common ophthalmic emergencies healthcare professionals will experience in clinical practice. The book is for all healthcare professionals who deal with patients with ophthalmic problems including Accident and Emergency doctors, General Practitioners, Optometrists, Orthoptists, Nurse Practitioners and Medical Students. This book is designed to provide a simple guide to the differential diagnosis and management of common ophthalmic emergencies.